Growing up, I have always found the universe and space in general to be exciting. It is fun to dream about what worlds remain unexplored. I also enjoy seeing photos from other worlds or thinking about the vastness of space. What does this have to do with Python though? Well, the National Aeronautics and Space Administration (NASA) has a web API that allows you to search their image library. You can read all about it on their website. The NASA website recommends getting an Application Programming Interface (API) key. If you go to that website, the form that you will fill out is nice and short. Technically, you do not need an API key to make requests against NASA’s services. However they do have rate limiting in place for developers who access their site without an API key. Even with a key, you are limited to a default of 1000 requests per hour. If you go over your allocation, you will be temporarily blocked from making requests. You can contact NASA to request a higher rate limit though. Interestingly, the documentation doesn’t really say how many requests you can make without an API key. The API documentation disagrees with NASA’s Image API documentation about which endpoints to hit, which makes working with their website a bit confusing. This week we welcome Pierre Denis as our PyDev of the Week! Pierre is the creator of Lea, a probabilistic programming package in Python. He can be found on LinkedIn where you can see his CV and learn more about some of the things he is up to. Let’s take a few moments to get to know Pierre better! I’ve a Master in Computer Science from UCL Louvain-la-Neuve, Belgium, where I reside. I’m working since 20 years as software engineer in [Spacebel](http://www.spacebel.be), a company developing systems for Space. Basically, I like everything creative and elegant. Beside arts, music, literature, I ‘m looking for this in physics, algorithmic, GUI and mathematics. I love programming, especially in Python. So far, I have initiated three open-source Python projects: UFOPAX (textual virtual universe), Unum (quantities with unit consistency) and Lea (probabilistic programming). For these developments, I tend to be perfectionist and consequently slow: I’m the kind of guy that re-write the same program ten times, just for the sake of inner beauty! Scientists have used a new algorithm to take a photo of a black hole. One of the most exciting parts about it to me is that they used a lot of Python libraries to do the magic. that appears to show Matplotlib running. The ReportLab toolkit supports adding many different charts and graphs to your PDFs. In fact, I have covered some of them in a previous article. However most of the examples I have seen, including the ones in my own article, do not show how to insert a chart as a Flowable. What that means is that most examples show you how to create a PDF with a single page that contains the chart in it. Most developers would want to be able to create some text, perhaps a table and insert the chart along with those elements. You would also usually have additional text following the chart. This week we welcome Abdur-Rahmaan Janhangeer as our PyDev of the Week! Abdur-Rahmaan is the French translator of Think Python. You can see what he is up to on his blog as well as on Github. Let’s take a few moments to get to know him better! I’m Abdur-Rahmaan Janhangeer from Mauritius, a paradise island in the Indian Ocean and currently one of the best tourist destinations. I have an IT business and i am shyly becoming a Python Trainer. I am mostly self-taught in programming. Concerning Python, I’m the Arabic Coordinator for the Python docs, translator of Think Python into French (publishing soon) and organising member for the py user-group of Mauritius. I also did some really tiny contributions to LinuxMint, Numpy and Odoo. No Starch Press is best known for creating books on computer programming. 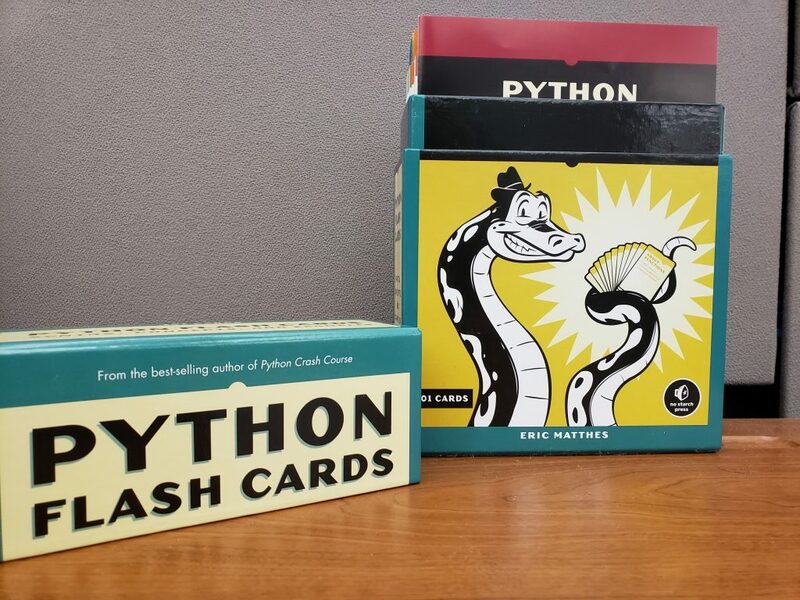 However they recently released a new product called Python Flash Cards by Eric Matthes, the author of Python Crash Course. I thought this was a unique product and decided to ask for a review copy. I thought it would be fun to write a bit about the cover art for my new book, Creating GUI Applications with wxPython. I had meant to post about that during the actual Kickstarter campaign. My original idea for the cover was to have the mouse directing a Phoenix to attack a snake. The Phoenix is a reference to the code name for wxPython 4 before it was released and you can still see references to Phoenix in the documentation and the artwork on some of the pages for the wxPython project. This week we welcome Kyle Stratis (@KyleStratis) as our PyDev of the Week! He is an active contributor at Real Python but also maintains his own website. You can catch up with his projects on Github as well. Let’s take a few moments to get to know Kyle! I’m a self-taught developer, I actually studied neuroscience up through graduate school, with a focus on mechanisms of attention in the auditory system. The coding I had to do at every step of the experimental process rekindled my early love of the craft, and a good friend stepped in as a mentor – so I taught myself and got my first job while I was writing my master’s thesis. UPDATE: All copies of the book have now been claimed! Thanks for checking it out! I have 5 copies of the eBook to giveaway. All you need to do to claim a copy is tweet this article and tag me @driscollis and then send me a direct message on Twitter with the link or send the link to me via the Contact form on this blog. 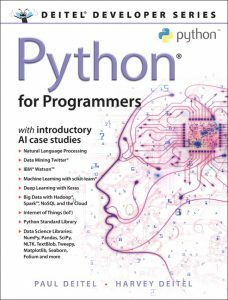 Written for developers with a background in any high-level language, Introduction to Python and Data Science for Programmers explores the Python language and Python APIs in depth, applying the Deitels’ signature live-code approach to teaching programming. Paul Deitel and Dr. Harvey M. Deitel present concepts in the context of fully tested programs, complete with syntax shading, code highlighting, line-by-line code walkthroughs, and program outputs. They feature hundreds of complete Python programs with nearly 20,000 lines of proven Python code, and hundreds of tips to help you build robust applications. You’ll start with an introduction to Python using an early classes and objects approach, and then rapidly move on to more advanced topics. Throughout, you’ll enjoy the Deitels’ classic treatment of object-oriented programming. By the time you’re finished, you’ll have everything you need to build industrial-strength Python applications.